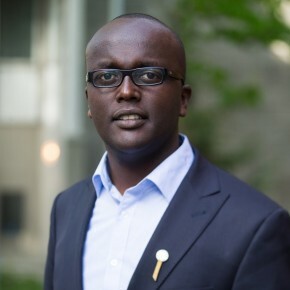 Éloge, a survivor of the 1994 Rwandan Genocide, was chosen by the Quebec Government as “young volunteer of the year” in recognition of his activities organizing and speaking at conferences and commemorative days about genocide and human rights to raise public awareness, as well as fundraising for Rwandan charity organizations. A law clerk to Justice Professor Sam Rugege, Vice President of Rwanda’s Supreme Court in the summer of 2009, Eloge is also the recipient of the 2009 Quebec Government Volunteerism award (Prix Claude-Masson: Homage Bénévolat Québec ). He has spoken to audiences of all ages across Canada of his personal experience in Rwanda and his passion to defend human rights around the world. As a leader in various student organizations, including the University of Manitoba Students’ Union (as its first Vice President of Advocacy), the African Students Associations, McGill Jewish Law Students Association, SHOUT (Students Helping Others Understand Tolerance), and YOT (Youth Outreach Team, War Child Canada), Éloge has worked tirelessly for human rights, access to education, and to raise awareness on issues affecting vulnerable communities in Canada, Rwanda and around the world. During his studies at the University of Manitoba in Winnipeg, Éloge helped to create the local Seventh Day Adventist African Fellowship Outreach Program to assist in the integration of numerous African Refugees settling in Manitoba. He volunteered with the Needs Centre for war-affected families and was a guest speaker at intercultural integration and health seminars of the University’s Medical Faculty as well as at the Summer Institute on Education and Democracy of the University of Manitoba’s faculty of Education. He was also actively involved in the scholarly and human rights education programs of the Arthur Morrow Center for Peace and Justice at the University of Manitoba. Éloge maintains a great deal of interest in cultural exchanges and in the intercultural integration of war-affected persons in Canadian society and other receiving countries. Éloge has twice been the Keynote speaker before the Manitoba Legislature on Yom Ha Shoah, at various Rwandan Tutsi Genocide memorial events and the Darfur genocide and war crime awareness events. He participated in organizing the 2007 Echenberg Genocide Prevention Conference at McGill University, as well as the Annual Raoul Wallenberg lecture series of the Winnipeg Jewish Federation. Éloge is also passionate about advocating for the poor and vulnerable in his community. He has participated in a number of fundraising activities for Tubahumurize (a Rwandan women’s collective for victims of violence), and has also worked with access to justice and genocide survivors’ support networks. After completing the Sauvé Program, Éloge completed his law degree, articled under parliamentarian and former Minister of Justice Irwin Cotler, and began working as the legislative assistant to Senator Roméo Dallaire. Over the course of his career, he aims to work in diplomatic, legal advocacy and consultancy capacities in areas of law, nation building and human security. He hopes to teach law in Rwanda. He also wished to contribute to the reconciliation work of his adoptive country (Canada) with its First Nations. In 2012, he was named an Honourary Witness to the Truth and Reconciliation Commission of Canada. In 2016, Éloge started working as an advisor on policy and legislative affairs for the Minister of Public Safety and Emergency Preparedness in Ottawa, Canada. Éloge explored the role of judicial institutions in rebuilding societies post genocide, war or ethnic conflict. More specifically, he looked at the anthropological and sociological roots of truth-telling about political and ethnic violence. His research considered to what extent this truth-telling process shapes a society’s concepts of justice and may succeed in generating peace and tolerance. He was mentored by the late F.R. Scott Professor of Constitutional and Public Law Roderick A. Macdonald, who teaches and publishes in many relevant fields, notably, jurisprudence and access to justice. In May 2015, Éloge returned to Sauvé House to participate in Sauvé Encore! 2015, as part of the Foundation’s Network outreach.